Stewart Russell was born in Scotland, studied fine art in England and Canada and currently lives and works in Melbourne, Australia. He maintains an international profile as a textile designer while working across a range of creative disciplines including curatorial work and a contemporary art practice. He began working with textiles in 1984, setting up his first print studio in Sri Lanka for Barbara Sansoni. He returned to the UK in 1987 to set up another print studio and lecture at the Scottish College of Textiles. 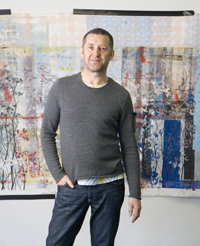 In 1993 he moved to London and became the director of London Printworks, a contemporary arts organisation based in Brixton where he developed an international reputation for an exhibition program, commissioning a series of artists and designers to discuss issues through the medium of printed textiles. In January 2000 Stewart and long term collaborator Donna O’Brien relocated from London to Melbourne to set-up Spacecraft, a textile studio designed to produce men’s and women’s fashion collections and instigate collaborations with contemporary artists. Stewart’s ideas for design projects are often driven by a fascination with traditional textile design and new directions in contemporary art. Exhibition projects and design deadlines create intense periods where new artwork emerges by necessity. Outside of these key periods of design activity, the studio makes time to work on new print ideas and printing techniques. Some ideas are slow burning and take months or even years to develop through to production whilst others are resolved within a few hours of coming up with the concept. Above all Stewart Russell’s studio is adaptable with fluid design and printing processes. This flexibility means that anything can happen, be changed or modified. Even the printing machinery and equipment comes and goes - last year Stewart fell in love with a piece equipment from a by gone era and built a production process around it. Currently, a totally new machine has been built to perform a function Stewart imagined one day whilst day dreaming. Through the re-building and modification of equipment Stewart aims to stay completely adaptable, able to constantly invent new ways of doing things. A main and ongoing print influence is the backing cloth from the print table. The table is used solely for experimentation and print development and becomes saturated with print ideas and colour tests. The cloth is replaced every 8 weeks and amongst the build up of printed ideas Stewart finds chance compositions. Stewart normally keeps his art and design work distinctly separate and the backing cloth is the only time the two areas of creative practice truly comer together. The studio has a waiting list for backing cloth pieces, prized by collectors as a chaotic historical record of the creative output from the print studio. Although essentially a by-product of the creative process the backing cloth print artworks, perhaps more than any single piece of design or artwork, manage to capture the energy of the studio in full flight.